Super Smash Bros. Ultimate[b] is a 2018 crossover fighting game developed by Bandai Namco Studios and Sora Ltd., and published by Nintendo for the Nintendo Switch. It is the fifth installment in the Super Smash Bros. series, succeeding Super Smash Bros. for Nintendo 3DS and Wii U. The game follows the series' traditional style of gameplay: controlling one of various characters, players must use differing attacks to weaken their opponents and knock them out of an arena. It features a wide variety of game modes, including a campaign for single-player and multiplayer versus modes. Ultimate includes every playable character from previous Super Smash Bros. games—ranging from Nintendo's mascots to characters from third-party franchises—and several newcomers, reaching a total of over 70. Main article: Gameplay of Super Smash Bros.
Super Smash Bros. Ultimate is a fighting game for up to eight players in which characters from Nintendo games and from other third-party franchises must try to knock each other out of an arena. Each player has a percentage meter which raises when they take damage, making them easier to launch in the air and out of the arena. Standard battles use one of three victory conditions: Timed, where players aim to win the most points by defeating opponents within a time limit, Stock, where players have a set number of lives and must aim to be the last player standing, and Stamina, where players must simply reduce their opponent's health down to zero to defeat them. Players can adjust the rules to their liking and save them as presets for future matches. Players can use various items to attack enemies or grant them power-ups, along with Poké Balls and Assist Trophies which respectively summon Pokémon and other non-playable characters to assist them in battle. In Timed matches, certain Assist Trophies can be attacked and defeated to earn points. Each character also possesses a powerful Final Smash attack, which can be performed either by obtaining a Smash Ball item or by filling up a special meter, both of which can be toggled on and off. The game features 103 different stages, which can each be played in alternative Battlefield and Omega forms or can be toggled to remove stage hazards. A new feature called Stage Morph allows players to select two stages that the game alternates between at certain intervals during a match. Other tweaks include new icons and gauges for character-specific abilities, such as Cloud's Limit gauge. In addition to returning modes such as Classic and Special Smash, new modes added to the game include Smashdown, where each character can only be played once, Squad Strike, where players battle in teams of multiple characters, and Tournament, which allows up to 32 players to battle in tournament brackets. Another set of modes revolves around a new mechanic known as spirits, which replaces the collectible trophies from previous games. Each of these spirits, based on a crossover character, can be used to power up a fighter with unique abilities, which can be used to fight against human or computer opponents and earn new spirits. Players gain spirits through pre-made challenges known as "Spirit Battles" that capture the theme of the character depicted by the spirit, embodied by one or more of the game's fighter characters and other specific level effects; for example, the spirit battle of Rayquaza, a flying dragon Pokémon, requires the player to defeat a large version of Ridley with added wind effects. A separate Spirit Board mode presents a rotating set of spirit battles for players to gain spirits from. Spirits have a growth and evolution system similar to Pokémon games, leveling the Spirits to gain more powerful effects, or means of merging core abilities into a new Spirit. The spirit mechanic is prominent in the game's single-player adventure mode, World of Light. The mode's narrative begins with an evil entity, Galeem, destroying the Smash Bros. world, vaporizing nearly all of the fighter characters and placing them under his imprisonment; only Kirby, due to his Warp Star, evades this attack. The player must explore the ruined world to rescue captured fighters and spirits by completing marked challenges. The player can use regained allies and spirits to overcome certain challenges on the map and eventually defeat Galeem. However, after Galeem is defeated, a new enemy, Dharkon takes over and, after being defeated, wages war against Galeem, and the player must destroy both of them. If just Galeem is defeated, Dharkon will engulf the world in darkness, but if just Dharkon is defeated, then Galeem will cover the universe with light. However, there is a path that allows the player to defeat both of them at once. When done so, the spirits are free from the villains' control and return to their homes, never to return. The game supports local multiplayer, local wireless with other systems, and online play via Wi-Fi or LAN connections. By defeating players online, players can earn tags which can be traded for in-game currency to buy new spirits, music, and Mii Fighter costumes. The game is compatible with Joy-Con controllers, the Nintendo Switch Pro Controller, and GameCube controllers via use of a USB adaptor. Like in the previous entry, amiibo figurines can be used to create AI-controlled Figure Players that can be trained to become stronger. Some time after the game's release, a service for the Nintendo Switch Online mobile app, known as "Smash World," will be launched, allowing players to check their game statistics in addition to sharing images and videos captured from the game to social media. Ultimate features over 800 music tracks, which can be played through the Switch's handheld mode while in Standby. Version 3.0 of the game, released in April 2019, adds a Stage Builder allowing players to create their own custom stages, and which they can share or download through the Switch Online service. Version 3.0 also includes a replay editor that allows players to edit stored replays and share those with others or download to other devices. These will be also available within the Smash World app. A four-player match on the Great Plateau stage (based on a location from The Legend of Zelda: Breath of the Wild) between Ganondorf, Link, Mario and Mega Man. Super Smash Bros. 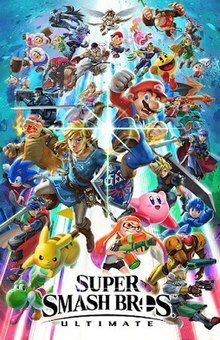 Ultimate, as with other games in the Super Smash Bros. series, features a crossover cast of fighters from several different Nintendo franchises, as well as fighters from series by third-party developers such as Sega, Konami, Capcom, Bandai Namco Entertainment and Square Enix. The base game features 74 playable fighters,[c][d] consisting of all 63 previous fighters from past entries and 11 new fighters: the Inklings from Splatoon; Princess Daisy from the Mario series; Ridley and Dark Samus from the Metroid series; Simon and Richter Belmont from the Castlevania series; Chrom from Fire Emblem: Awakening; King K. Rool from the Donkey Kong series; Isabelle from the Animal Crossing series; Ken Masters from the Street Fighter series; and Incineroar from Pokémon Sun and Moon. When starting the game, players only have access to the eight starter characters of the original 1999 Super Smash Bros. game and must unlock the rest by completing various challenges. Certain new and returning characters whose movesets and abilities are directly based on another character in the game are now classified as "Echo Fighters". These characters are nearly identical to the fighter they are based on, sharing key attributes such as movement speed, general attack power, jumping prowess, weight, and knockback power. All Echo Fighters have their own unique taunts and victory animations, with additional aesthetic differences or even gameplay changes if necessary. On the character selection screen, these characters can either be listed individually or stacked with the fighters they are based on. Select characters also have alternative skins featuring different genders or sometimes other characters, such as Bowser Jr. who has a selectable appearance to be any of the other Koopalings, but otherwise have identical animations and aren't treated as separate characters. Several returning characters received updates to their outfits, such as Mario having Cappy from Super Mario Odyssey accompanying him and Link wearing his outfit from The Legend of Zelda: Breath of the Wild. Six additional characters are planned to be added to the game via downloadable content (DLC) following its launch. The first of these characters, Piranha Plant from the Mario series, was released on January 29, 2019, and made available for free to those who purchased and registered the game with a My Nintendo account before the end of that month. The other five characters will each come with an additional stage and music, and can either be purchased individually or as part of the Fighter's Pass. The first announced paid DLC fighter was Joker from Atlus' role-playing game Persona 5, who was released in April 2019. Super Smash Bros. Ultimate was developed by Bandai Namco Studios and Sora Ltd., the same studios that developed Super Smash Bros. for Nintendo 3DS and Wii U, for the Nintendo Switch, with series creator Masahiro Sakurai returning to direct. Unlike previous Super Smash Bros. games, the team was not assembled from the ground up, which sped up preparation time. The project plan for the game was in the works by December 2015, when the DLC for 3DS and Wii U was in development, and finished after it was completed. Staff gathering was done soon afterward. The development period was shorter compared to previous entries in the series. Hatena Co., Ltd. also assisted with development of some functions. Sakurai's goal for Ultimate was to include every character from previous games, as he did not want fans to be disappointed. However, he knew this would be a complex problem for both development and licensing; it would also drastically increase the cost of development. The return of Bandai and Sora made it easier for this to happen. Sakurai also wanted to adjust character abilities as to speed up the game, although not to an extent to which it would alienate players unfamiliar with the series. Sakurai knew that Ultimate was a core game for Nintendo, and that it had a dedicated playerbase that he did not want to disappoint, and believed that completing this goal was necessary to satisfy the fan base. Sakurai was also faced with the decision to create a completely new game system or build off of pre-existing ones; he chose to build off pre-existing ones because there would only be about a third of the characters he desired in the final game. All the returning characters' abilities had to be re-balanced so they could work in Ultimate. Originally, gameplay would differ between the Switch's docked and handheld modes, but Sakurai scrapped this because the system's screen in handheld mode was better than he thought. Voice lines recorded by David Hayter for the character Snake were used for Ultimate, despite Hayter having been replaced in Metal Gear Solid V. The addition of Ridley from Metroid as a playable character has been something that the Super Smash Bros. community had been requesting from the series for some time. In 2008, Sakurai had said that he knew Ridley was a high-demand character, but thought that he was "impossible" to add unless they were able to sacrifice the character's size for balancing purposes. So Ridley could be included in the game, Sakurai studied art of the character and redesigned him so he could stand upright. All characters were chosen at the beginning of development except Incineroar, who had not been created yet; the team instead left a space open for a Sun and Moon Pokémon. The Inklings' ink mechanic proved challenging to implement due to the way it interacts with environments. The team built Ultimate from scratch with new assets and content. Localization manager Nate Bihldorff stated that the game significantly upgraded lighting effects and texture rendering from the game engine of the Wii U version. The new World of Light mode was inspired by Brawl's (2008) Subspace Emissary, and Sakurai chose to start it with a cataclysmic event because he thought it would leave a greater impact on players. The team conceived the Spirits mechanic because they wanted to create an enjoyable single-player mode but did not have enough resources to create character models. While it did not let them tell stories for individual fighters or create new locations and rules, the Spirits let them use a variety of characters and assets. One part of the team chose Spirits to include in the game and had to thoroughly research them. According to Sakurai, the Spirits mode was essential for using various franchises. Like previous games in the series, Ultimate features a number of well-known video game music composers and arrangers providing a mix of original music and rearrangements of various tracks for the represented franchises, with over 800 tracks in total. New to Ultimate is the tying of tracks to franchises instead of individual stages, as well as the ability to create custom playlists to listen to outside of the game when the Switch is in handheld mode. Sakurai stated that he began contacting composers over a year prior to release, providing them with a database of over a thousand suggested track ideas. In addition, he allowed them to submit their own personal favorites, with those choices being given priority for inclusion. While Sakurai oversaw the process and preferred that the music retain the spirit of the original games, the direction of them was generally handled by the composers themselves. The main theme, "Lifelight", was composed by Hideki Sakamoto; most of the original music is based on it. As with previous entries, Nintendo planned to offer new fighters through DLC; however, unlike with the previous 3DS and Wii U version where players had the ability to request which characters they wished to see in the game, Nintendo chose which characters they will add by November 2018. Sakurai believed that despite characters like Joker, the first announced DLC fighter, not necessarily being from games usually associated with Nintendo, they were added due to being "emblematic" of the types of characters they wanted to add to Ultimate, adding that they "bring just a whole different level of fun and enjoyment for the player". The Piranha Plant was chosen as a DLC character because Sakurai wanted to add diversity to the roster. Attendees at the 2018 San Diego Comic-Con playing the Super Smash Bros. Ultimate demo. Ultimate was teased during a Nintendo Direct presentation on March 8, 2018, under the working title Super Smash Bros., with the release year shown to be 2018. Nintendo formally announced the game at E3 2018, revealing that the full roster of characters from past games would be included, as well as its release date. Demo versions were playable at E3 in June, and at the San Diego Comic-Con the following month. IGN nominated Ultimate for its Best Game of E3 2018 award; the game won Best Nintendo Switch Game from both IGN and Gamescom. Two Nintendo Direct presentations in 2018, one on August 8 and another one on November 1, were devoted to the game, revealing new characters, stages, and game modes. Nintendo released Super Smash Bros. Ultimate worldwide on December 7, 2018. In addition to the standard retail version, a special edition containing a Super Smash Bros.-themed Nintendo Switch Pro Controller and a Switch with a download code was also released. An additional special edition contained a pair of Super Smash Bros.-themed Joy-Con as well as a Switch console, a Super Smash Bros.-themed dock, and a download code for the game. A GameCube controller with the Super Smash Bros. Ultimate logo was released on November 2, 2018. One of the game's new additions had the character Mr. Game & Watch assuming the appearance of a feather- and loincloth-wearing Native American when using one of his attacks—a reference to Fire Attack (1982), in which the player controlled a cowboy defending his fort from attacking natives. Some series fans saw this as racist, leading to Nintendo apologizing and removing the animation in version 1.1.0. Two weeks prior to its release, a leaked copy of the game was distributed across the internet. Nintendo took steps to issue copyright strikes on YouTube videos using data mined content, while fans worked to isolate spoilers, particularly the World of Light story mode, from those that had played the leaked version. Ultimate received "universal acclaim" from critics, according to the review aggregator platform Metacritic. The French video game website Jeuxvideo.com called it the best game in the series, praising the improved gameplay, larger cast of characters, stages, options, soundtrack, which "brilliantly mix gargantuan content with nostalgia". IGN agreed and called it the most complete Super Smash Bros. yet. Critics lauded the huge cast of characters and levels, new game modes, and combining of the best elements from its predecessors. However, the game's online mode received criticism for its technical performance and matchmaking. Many players found significant lag affecting their games, even when using wired connections over wireless, while the game's matchmaking features did not adhere to players' criteria. The matchmaking process was further criticized for making it difficult for friends to join matches over random players, and not allowing multiple local players to join in online matches. Fans of the series had complained so much on Ultimate's subreddit that the administrators forwarded all complaints to a separate thread. In November 2018, Nintendo announced Ultimate was the most preordered game for the Switch and in the series. The Association for UK Interactive Entertainment reported that Ultimate was the fastest-selling Switch and Super Smash Bros. game in the United Kingdom, with physical launch sales 302% higher than those for Super Smash Bros. for Wii U, 233% higher than those for 3DS, and 62.5% higher than those for Brawl. In its first three days on sale in Japan, the game sold 1.2 million copies, outselling Pokémon: Let's Go, Pikachu! and Let's Go, Eevee! and The Legend of Zelda: Breath of the Wild in the region. Within 11 days of its release, Ultimate had sold more than three million copies within the United States, making it the fastest selling Switch game in the country. It was similarly the fastest-selling Switch game as well as the fastest-selling game for any Nintendo console in Europe based on the first 11-day sales. It was estimated that the game sold and shipped over five million copies within its first three days of release. Within three weeks, Ultimate became the fifth bestselling Switch game in the United Kingdom, surpassing the sales of Splatoon 2. In January 2019, Amazon reported that Ultimate was their highest selling video game product of 2018, with Nintendo officially announcing that the game had shipped over 12.08 million copies worldwide. Ultimate was also Nintendo's fastest-selling game of all time, surpassing New Super Mario Bros. Wii which had sold 10 million within eight weeks. The game won the award for "Best Nintendo Switch Game", "Best Fighting Game", and "Best Multiplayer Game" in IGN's Best of 2018 Awards, whereas its other nominations were for "Game of the Year" and "Best Video Game Music". This page is based on the Wikipedia article Super Smash Bros. Ultimate; it is used under the Creative Commons Attribution-ShareAlike 3.0 Unported License (CC-BY-SA). You may redistribute it, verbatim or modified, providing that you comply with the terms of the CC-BY-SA.